For use on most Mercedes from 1969 to 2006 (see exceptions below)- UPS Ground Shipping ONLY! Buy the complete kit and save $$. 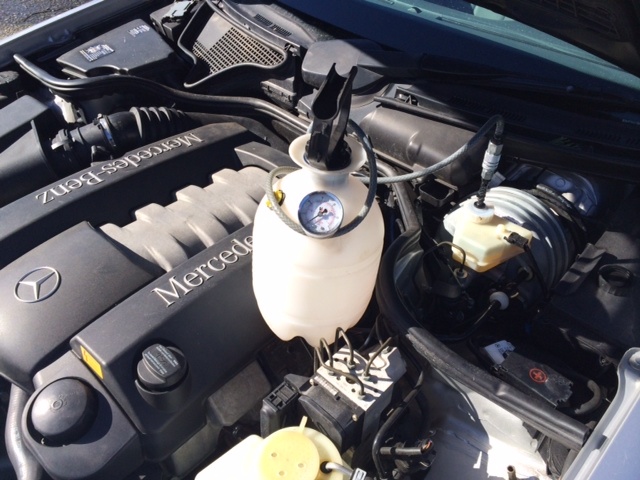 This is almost everything you need to do a fast, clean and efficient brake fluid flush on your older Mercedes Benz passenger car. See detailed list of applicable models listed below. Please note the pressure tank now includes a splice fitting in the hose that will allow you to add different attachments in the future (not shown in picture). Kent is always working on new ways to use this pressure tank. See related products below for updates. Included in the kit are the following five (5) items. To learn more about each one click on the title link. Complete assembled Pressure Brake Bleeder Tank. This is assembled from a one-gallon garden sprayer. The complete bleeder is available separately. Compete assembled brake fluid twin chamber capture tank. Designed by Kent and truly a unique and highly useful product. This can be purchased separately. I liter Kent's favorite DOT4 moisture-resistant brake fluid. Pressure Brake Fluid Bleeder Instructions and Twin Chamber Capture Tank instructions in PDF format. Three pairs of nitrile gloves. Always wear gloves when bleeding brakes. Custom made in our own shop. Please, no expedited shipping. THIS KIT CAN ONLY SHIP UPS GROUND. If you choose another shipping method the order will be held. Any time you bleed your brakes you will need absorbent pads or catch clothes for any spills. We have a great pack of incredibly absorbent pads you can add to your order. Here is a picture bleeding the brakes on a 2000 E430. See related products below to purchase other brake-related products or to purchase items separately.